But, more importantly, why would you choose to deny the world the gifts and talents deep inside you, that are only ever brought to the surface by your stresses, your strivings and your struggles? Because that's what you do when you 'go with the flow' - you deny the world around you the opportunity to receive all that you have to offer. Sure, there may be times when tracking with the currents of life, rather than swimming against them, is the smart choice. But those times are simply interludes - spaces in which you can hide while you catch your breath for what comes next. It’s almost an irony that this paradigm for life filled with stress, striving and struggle, rejected as futile and pointless by the hipsters, the spiritual and the enlightened, is embedded deep within the rhythms of nature, which lies at the heart of the universe those very same people seek to be at one with. Nature knows the value of not simply going with the flow. And nowhere is that paradigm better expressed in nature than in the lifecycle of wild salmon. 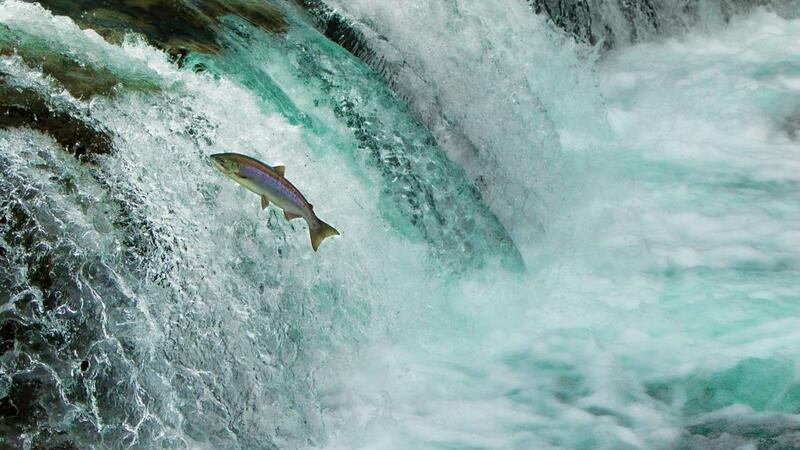 While salmon spend long periods 'going with the flow' of the rivers, lakes and oceans they inhabit, when the time comes to make sure that their lives count for something, those salmon embrace their calling to strive and struggle, as they embark upon a treacherous and awe-inspiring adventure to their breeding grounds. An adventure that pitches them at direct odds to the flow of the current. And, as they battle the current, fighting for forward momentum - driven on by a single, noble goal to produce another generation of salmon to follow in their wake - they unknowingly play a bigger part in ensuring that the equilibrium of nature remains. You see, with every gasp and thrash, as they force their bodies through the water that beats them back, their scales are disturbed and they shed vital nutrients into the waters around them. And that disturbance, caused solely by their determination to go against the flow, ensures that the river’s ecosystem, and all the other surrounding ecosystems that rely on it, stays in balance. It would surely be easier for salmon to stay put, to go with the flow of whatever river or stream they found themselves in. Surely, they they have no specific need to fight the river just to bring forth new generations of salmon. But, whether they need to fight against the currents or not, that’s exactly what they do. Which is just as well, because, if they didn’t, not only would the the world be denied a most inspiring spectacle, nature itself would suffer. It seems that salmon somehow know that they were born for struggle. Willingly, maybe even eagerly, they take their place in the adventure set out before them. And you are just like those salmon. You may not feel driven to fight the currents of life in pursuit of your destiny; but, whether you feel like it, or not, you were born for struggle; to swim against the current; to step into the adventure set out in front of you. The question is, though, will you embrace the struggle? You see, while you may prefer to drift wherever the currents of life carry you, that is not the life you were designed to live. Just as salmon are designed to release nutrients into the ecosystems of the rivers in which they swim, so you are designed to release nutrients - your gifts, talents, creativity, love, joy; the things that make you, you - into the ecosystems in which you ‘swim’. In your workplace, your school, your church, gym, club or society, and as you move among your friends and family, you have the opportunity to release nutrients that enrich the world around you. But you can’t do that when you opt out of the adventure set before you - when you ‘go with the flow’. Because, when you ‘go with the flow’ you don’t take the ‘cool’ choice, or step onto the mysterious path. Rather, you abdicate your responsibility to leave your mark on the world (and it is a responsibility). And you deny your calling to live with intentionality, as you thrown yourself on the mercy of chance, and pass up an opportunity to step into the adventure you were made for. And, when you do that, not only do you miss out on what life wants to give you, the world is poorer for your choices.